Brandings require a lot of manpower so the paniolo community comes together during branding season. While the cowboys do most of the separating and roping, family members and friends volunteer for the less skilled work such as holding down a calf or spraying iodine on it once it has been castrated. "Everyone know what their role is," says Goddfrey Kainoa, one of whose calves is being branded here. 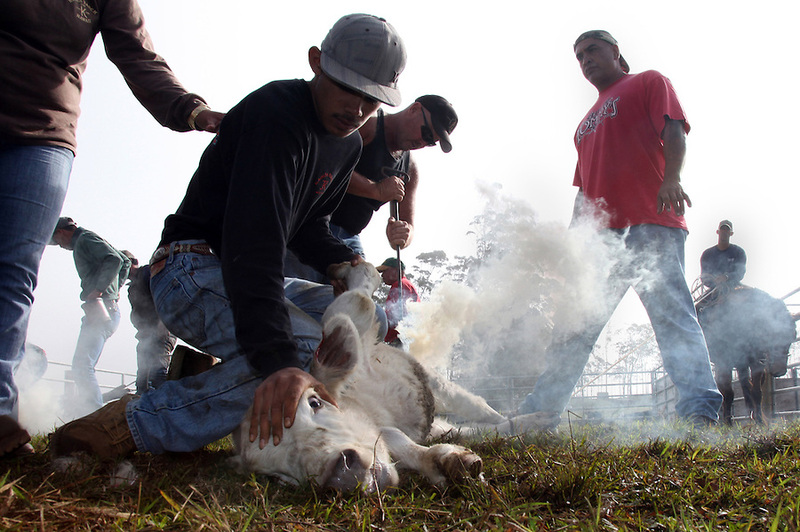 Kainoa, who, through the Haiwaiian Homelands Commission Act, leases a piece of land on which he raises a small herd of cattle in Waimea, Hawaii and is one of the original descendents of the Mexican vaqueros who taught the Hawaiians their cowboys skills.